Fans love Kimi Raikkonen, even rival racers appreciate the no-nonsence Finn, so much so that one fan has started a petition on Change.org urging Ferrari to re-sign the driver. Raikkonen is reportedly on the verge of losing his Ferrari race seat to Charles Leclerc as the Scuderia have decided to honour former president Sergio Marchionne’s race deal with the Monaco driver. As for Raikkonen, he is out of Formula 1 if the rumours are true. Posted by Christy John, the petition plea reads: “Replacing Kimi Raikkonen just because of an existing deal made by the previous Ferrari head is not justifiable while Scuderia Ferrari’s current Head and Sebastian Vettel need Kimi to keep the balance in the team. As of 8am Friday morning, it had gained 12,560 signatures. The chances of it persuading Ferrari to change their tune are slim to nothing, however, it is a reminder to the Scuderia that they are saying goodbye to a huge marketing tool, as well as one of the best drivers on the grid. The line that launched a thousand memes, sold hundreds of T-shirts and led to one very uncomfortable skit with Matt LeBlanc. Racing towards the victory at the Yas Marina circuit in 2012, Raikkonen received a bit of helpful advice from his pit wall. He didn’t want it. It took off as one of the best lines ever said by a Formula 1 driver, cementing his I-don’t-care attitude. Unfortunately, it also led to this extremely uncomfortable skit. The 38-year-old does not mince his words, it is as if he just cannot be bothered to play the media game. Asked during this season what rule changes he would implement in Formula 1 if he was in charged, he replied: “I don’t understand what’s the point for me, to give you a list, because in the end I have zero power. In an era of PR drivers, who thank everyone and their dog even when they have the worst afternoon in the worst car, Raikkonen says it as it is. And he’s got no time for kissing butts. One of his more memorable lines came back in 2006 when he was driving in his last race for McLaren. His missed a speech given by Pelé to commemorate Michael Schumacher, who was retiring from the sport. The ‘Iceman’ has shown bouts of fearlessness during his time in Formula 1, and that’s not even taking his days in rallying or NASCAR into account. He wowed fans and commentators alike when, in 2002, he kept his foot flat at the Belgian GP and drove his McLaren through a sea of smoke caused by the blow-up of a BAR Honda. In 2009 his car was engulfed in blames when Heikki Kovalainen drove out of the pits with the fuel hose still attached to his car. Drops of petrol trickled into Raikkonen’s eye but rather than retire from the race and seek medical attention, he continued. He finished P6. “My eyes are still burning, but I’m all right,” he said. Raikkonen entered Formula 1 in 2001 with Sauber despite having only ever contested 23 single-seater racers. A year later he signed with McLaren, bagging his first of (as of 7 September 2018) 100 podiums. From McLaren he went to Ferrari when he entered the season-ending Brazilian Grand Prix locked in a three-way battle for the Drivers’ Championship. A victory on the day saw him take the title by a single point, beating the McLaren pairing of Fernando Alonso and Lewis Hamilton. 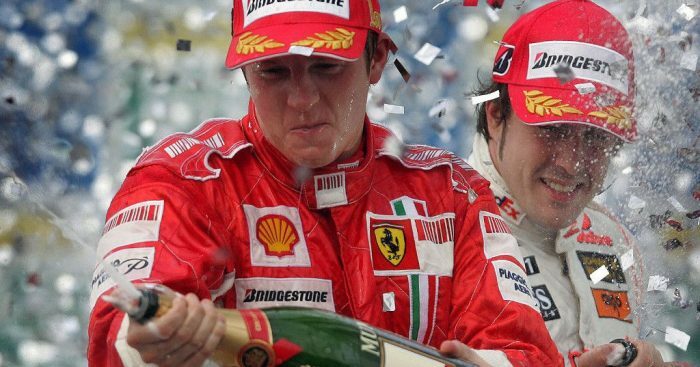 Although that stands as Raikkonen’s only World title, he twice finished runner up with a further two P3s to his name. His 20 grands prix wins puts him tied for 15th on the all-time record along with Mika Hakkinen while he is only the fifth driver in history to achieve 100 podiums.